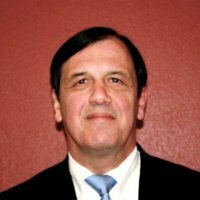 George Kraw is a founding member of the Kraw Law Group. For more than five decades, the Media Guild Pension Plan has paid lifetime pensions to retired participants, chiefly the Guild-covered staff at the San Francisco Chronicle and its ancestors in the once-thriving Bay Area newspaper industry. It’s one of many multi-employer benefit plans created by Congress in the aftermath of World War II, and has proven to be a tough survivor of recessions, regulatory hits and the near-collapse of daily print journalism. Today, the Media Guild Pension Plan is down to a single employer – the Hearst Corp., publisher of the Chronicle, which works with the Guild and a joint labor-management board to make sure the plan meets its financial obligations. Plan participants are expecting official word soon from the plan’s fiduciaries as to its current funding status. It’s even possible that recent financial gains will push the plan out of the so-called “red zone” of underfunded pension plans. It’s all part of a thoroughly unexpected result of the 1947 Taft-Hartley legislation, which was intended mainly to weaken organized labor but wound up strengthening unions – and benefiting millions of union members and their families for decades. But today’s anti-union environment and inflexible regulation pose a whole new array of threats. Already, a sister Taft-Hartley trust, administered by the Guild to provide health benefits at the Chronicle and other employers, is being dissolved following a contentious round of collective bargaining. In that case, Hearst stepped in to provide health benefits through its corporate system, allowing the Guild trust fund to pay out its final reserves to employees before shutting down later this year. The pension plan, with its payout promised for decades to come, has proven much more resilient. The plan was established in 1958 by the San Francisco-based affiliate of The Newspaper Guild and various Bay Area newspapers. Most of those newspapers no longer publish or have dropped out of the pension fund, leaving only Hearst Corp. Even the Guild itself had to withdraw as a participating employer, paying a hefty liability to avoid the mounting costs. Financial stress caused by the flight of participating employers and declining workforces forced trustees in 2005 to begin canceling or freezing some types of benefits. Since 2009, it stopped granting additional credits to current participants no matter how long they keep working in a covered job. Despite the benefit freeze, the plan continues to pay pensions to those eligible for benefits, no matter who their employers were. It survives in hostile times, where the new normal for many retirees is an inadequate lump sum on retirement, or no pension at all. The plan’s monthly pension is set as a percentage of earnings before 2010. For most participants, the pension is approximately $1300 per month depending on years of service and how long vested in the plan. Guild plan participants can receive benefits as early as age 55. However to receive full benefits, participants should wait until age 65. Eligible participants can choose a joint annuity option that provides a pension for their spouse or domestic partner after the participant dies. In low-interest-rate, low-inflation environments like today’s, defined benefit pensions are especially valuable to retirees, for whom buying a similar pension or annuity is a prohibitively expensive proposition. Multiemployer pension plans, like the Media Guild’s, require both union and employer sponsors. Even though some 10 million workers are currently covered nationwide by these pension plans, they have become an endangered species – costly to protect from extinction. This chart originally appeared in a post titled “Millions of Americans unprepared for retirement savings,” on mybudget360.com. The plans promise a defined benefit for the life of the retiree or eligible partner. Sponsor employers such as Hearst are responsible for any funding shortfalls. This open-ended liability makes employers loath to participate, and eager to exit when they can. Most employers prefer defined contribution plans, such as 401(k) plans, which generally cost more to administer and provide a smaller retirement benefit than a defined benefit plan. For employers, the chief advantage of the defined contribution plan is that the employer’s liability is capped. In effect, it puts the risk on the retirees if they outlive their retirement income stream and assets. Many public employees remain eligible for defined benefit retirement plans. 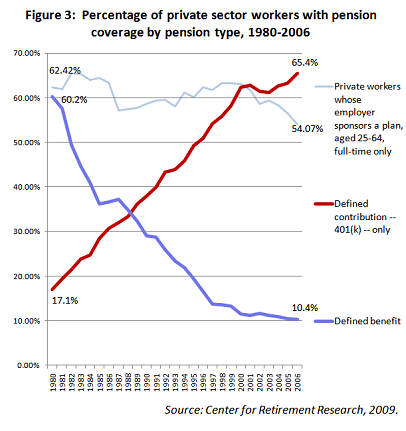 But these days, federal government policy favors cutting back private defined benefit plans in order to ease the financial pressure on the Pension Benefit Guaranty Corporation, a hitherto obscure government sponsored organization that insures both single employer and multiemployer defined benefit plans. The agency guaranties minimum pension payments of up to around $13,000 a year for 30-year participants in insolvent multiemployer plans. The guaranty can be higher for single employer plans, based upon the financial status of the individual pension fund when the PBGC takes control. A new law, the Multiemployer Pension Reform Act of 2014, allows the most severely troubled multiemployer plans to cut pension payments. Still, the PBGC remains at risk of becoming the first federal government sponsored entity ever to default on its obligations. It has liabilities that exceed the assets of the multiemployer plan program by more than $60 billion. Congress could fix the PBGC’s troubles by providing financial assistance, as was done for the major banks during the 2008 financial crisis. But the sponsors of troubled multiemployer and single employer pension plans generally lack the political influence and access necessary to achieve such results (the plans themselves are not permitted to engage in lobbying activity). The current politically acceptable solution for the problems of multiemployer pensions is to let the worst of them cut benefits, which authority was incorporated into the Multiemployer Pension Reform Act. The Media Guild Plan has assets of over $120 million, and does not fall into the category of plans that will need to cut benefits in order to remain solvent. (Were its finances to deteriorate, Guild participants would still have the PBGC guaranty, so long as the insurance program remains solvent.) Government filings show that the plan currently receives contributions of around $5 million a year from Hearst Corp. It has an investment of assumption rate of 7.5 percent, which means the trustees expect it to earn on average 7.5 percent annually from the plan’s investments; this rate is in line with those of most multiemployer plans. Because the plan has frozen new benefit accruals and been closed to new employees since 2010, it can still provide a substantial benefit for Guild workers who qualified before then, notwithstanding the decline of the newspaper industry. The bill would limit the freedom of employers and employees to establish and maintain welfare funds. It would prescribe arbitrary methods of administering them and rigidly limit the purposes for which they may be used. This is an undesirable intrusion by the Government into an important matter which should be the subject of private agreement between employers and employees. The criticisms and predictions concerning multiemployer plans proved wrong; the end result surprised both sides. The plan structure was intended to limit the influence of unions over employee benefit programs, as part of the overall goal of the Taft-Hartley law was to restrain the power of unions. The irony of multiemployer plan origins is how well the plans have worked subsequently, and how much they have served to strengthen unions. In effect, the program set unions up as powerful administrators of basic employee benefits, most of them functioning smoothly and without much controversy decade after decade. It started, however, from a period of labor unrest after the Second World War, when the end of wartime price controls and the bumpy transition to a peacetime economy led to frequent conflicts between employers and workers. The chief sponsor, Sen. Robert Taft (R-Ohio), was a principled conservative who earned a chapter in John F. Kennedy’s book ‘‘Profiles in Courage’’ for his opposition to the ‘‘victors’ justice’’ of the Nuremberg Trials, an opposition that likely cost him the Republican presidential nomination in 1948. He was determined to reduce the power of unions and initially hoped to overturn much of the New Deal labor legislation enacted in the 1930s. The law itself was largely written by a junior lawyer from Taft’s Cincinnati law firm, and contained a wide array of restrictions on unions and the collective bargaining process, of which the rules for multiemployer plans were only one piece. The plans became an unexpected triumph of labor management relations in the latter half of the 20th century by providing pensions, health care, disability income, unemployment coverage and training to millions of American working families. The multiemployer plans also provided stable workforces for American industries. They took hold in such diverse industries as media, food, coal, hospitality and retail, among others, and are especially important to industries with mobile, transitory workforces, such as construction and entertainment. Today the plans are over-regulated and underfunded in a fitful economy with declining union membership. The plans work best as a family of benefit and social protection programs, and not just stand alone pension, or health care programs. But federal government policy is chiefly focused on compliance issues for the plans. There is little effort to encourage their growth in spite of their proven ability to train and maintain workforces. A better approach would be for the federal government to provide the financial resources necessary to address the plans’ challenges, both through tax benefits to health-care plans and regulatory relief to pension plans. That is not going to happen in the current political environment. Because of the union connections to the plans, proposals for government assistance are routinely criticized as bailouts for unions. Throughout the 2008-2009 financial collapse and subsequent recession, Taft-Hartley multiemployer pension plans and other savers became collateral damage of Federal Reserve policies that used low interest rates to revive the economy. The highly regulated pension plans saw more constraints placed upon them through the Pension Protection Act, in a failed attempt to regulate into solvency financially weaker multiemployer plans. The end result was to raise the overall costs of the plans, without making their participants safer. To broaden participation, the pension plans need flexibility. Multiemployer plans cannot be saved by inflexible regulatory regimes that do not allow individual plans to address their individual circumstances. The latest effort to fix multiemployer pension plans by legislation is the Multiemployer Pension Reform Act of 2014, which was signed into law by President Barack Obama on December 16. It is long, complicated and most useful to plans in immediate danger of insolvency. Major plans such as the Central States Teamsters, the Bakery and Confectionary Workers International Pension, and the Automotive Trades International plans are all significantly underfunded and have a larger number of inactive employees than active employees. Even with the new legislation, some multiemployer plan benefits would have to be cut below the PBGC minimums before the plans could survive on current assets and contributions. It appears that the new legislation may not be sufficient to save the PBGC’s multiemployer program, in which case the government will be faced with the Hobson’s choice of raising the insurance premiums on solvent plans to levels that the plans cannot afford, or defaulting on the PBGC’s obligations. If the last remaining employer, Hearst Corp., were to withdraw from the Media Guild Pension Plan, it would have to keep paying into the plan under the complex rules of multiemployer plan withdrawal liability. Financial predictions are always problematic, but the Media Guild’s current assets can likely pay pensions for at least a decade without any additional money. Future policy changes that would ease plan merger rules and provide greater incentives to employers also could revitalize plans like the Media Guild’s. And higher interest rates, nowhere to be seen now, would wipe out plan deficits quickly once they exceeded the plan’s investment assumption rate. For the foreseeable future, the Media Guild Plan will survive difficult times so long as it maintains the current level of employer contributions and meets its investment assumptions. George M. Kraw (gkraw@kraw.com) is a lawyer with the Kraw Law Group in Mountain View and Newport Beach, Calif., and a former union representative to the Pension Benefit Guaranty Corporation’s Advisory Committee. This article is also posted at BenefitsLink.com.